Though it was a very warm spring where I live, I perhaps jumped the gun a bit with my “summer recipes” column. But as of a few days ago it is now finally, officially summer! And that means, it’s time for summer reading to begin in earnest. The typical “beach books” reading list is usually heavily weighted towards some breezy fiction (not to be confused with one of my favorite mobile printing firms, Breezy). 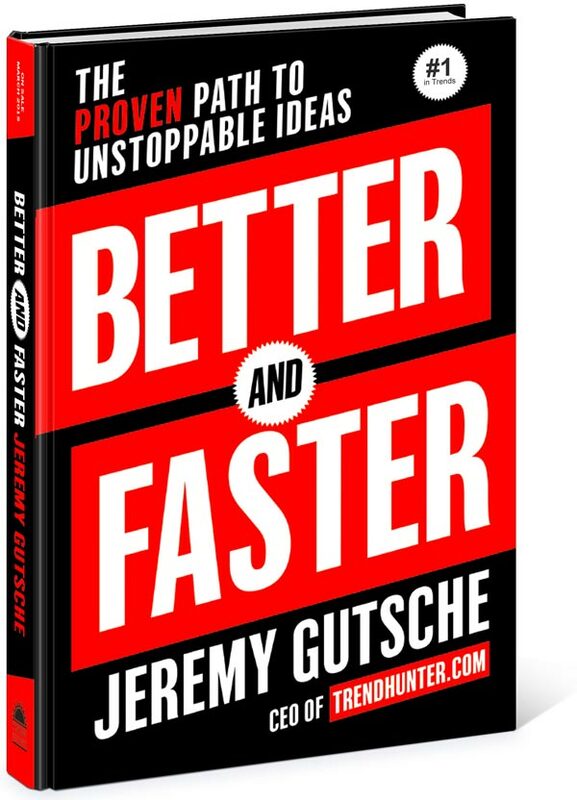 But this summer I am recommending at the top of my list, Better and Faster: The Proven Path to Unstoppable Ideas, by Jeremy Gutsche (@jeremygutsche), CEO of Trendhunter.com. The title was published in mid-March of this year, when I received word of it through one of the world’s leading “recommendation engines”; the one at Amazon.com to be exact. 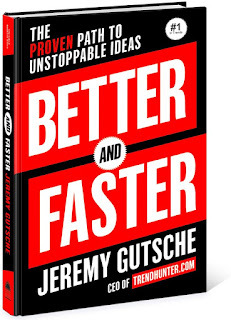 And though Gutsche and Trendhunter were new to me at the time, and the “Proven Path to Unstoppable Ideas” part of the title seemed a bit bombastic, I checked out a copy from my local library a few weeks later. From first indications, I was positively inclined to liking it (as well as puzzled by the fact of my late discovery of Gutsche and Trendhunter), including being strongly influenced by the blurb by friend and trusted advisor Guy Kawasaki on the back cover and their BetterandFaster.com website (see screenshot below) — complete with Kawasaki’s own brand of bombasticity, I might add! I have been doing an enjoyable “slow read” ever since, using library renewals and then finally buying the e-book version for my Kindle. And from the pages I have come up with some interesting applications to the printing and imaging industry I will expand upon in a bit. 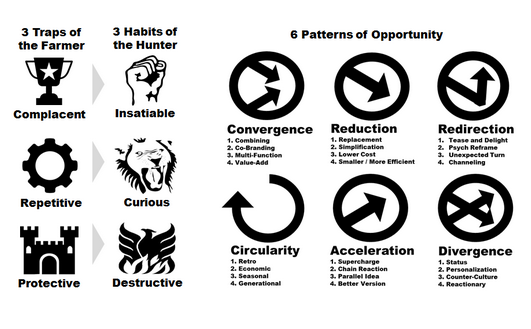 The book’s format is simple and complete (sounds a bit Kawasaki-esque right there) — Gutsche’s contents include defining his basic definitions, starting with the metaphor using the differences between farming and hunting, and then describing six fundamental patterns which underlie most business and technology trends — convergence, divergence, cyclicality, redirection, reduction, and acceleration, which Gutsche explains through the remainder of the book. 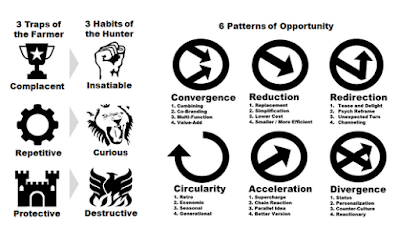 I have found numerous examples of printing and imaging to apply to each of the six patterns, but it is enough for this space to apply a few of the farmer/hunter points to the industry I have been part of since the mid-1980s. The basic idea of avoiding the farmer mindset in favor of the hunter is a bit paradoxical, in that, human-evolution-wise, it was the shift from hunting-and-gathering to agrarian ways that catapulted our species into its grand success of the last 10,000 years or so. But Gautsche makes the point that in business, we usually approach problems with the determination of farmers, figuring out what works and then applying the same methods, over and over again — with a few tweaks of course — expecting and generally getting steadily improving results. But success is not guaranteed to continue forever into the future, and Better and Faster highlights three traps that farmers (and their analogous business leaders) find themselves in, including complacency, repetition, and protectiveness. The book includes many, many great examples, a few familiar, and many new to me, but one of the natural examples for inclusion in the section about farmers and the traps they get caught in is Kodak and its “miss” on digital photography, even when the initial technology was right in front of their noses. They were collectively missing the hunter instincts of curiosity and its related practices. According to Gutsche, instead of paying attention to experimentation and continually reassessing assumptions, eventually moving beyond their past and what had previously been successful, Kodak’s strong corporate culture stiff-armed the first digital camera prototypes a maverick Kodak scientist had developed in-house in the mid-1970s, and continued with their farming approach to the imaging and printing business. Recently, I witnessed something firsthand that was less dramatic but indicative of this farming versus hunting mindset. An industry leader had gathered together the analyst committee to share, under embargo and prior to its official launch, a collection of new technologies the firm had developed. It had taken a huge investment in terms of years and dollars, with the end result being that they could now offer improvements in product price/performance, and in particular, through following the curve of efficiency and miniaturization, much smaller products in terms of mass and footprint, with corresponding improvements in energy usage. The executive in charge of the analyst briefing was excited by what he had to talk about, but clearly dejected by the lack of enthusiasm to match on the analyst side. Despite the investment and measurable improvements, I look back to that less-than-overwhelming reaction as a response to how a declining industry is coping, and in this case it was touting new seeds and fertilizer on the old farmland, when whole new fields need to be explored. Go figure - Apple making lots of profit on watchbands! I enjoyed seeing this article by Julia Love @byJuliaLove of Reuters, in Business Insider this morning. In addition to having sold 2.79 million watches, according to Slice Intelligence @SliceIntel, apparently Apple is selling, and making lots of profit from, the watchbands that go with them. It's the oldest business model in the books, or nearly so - the classic "razors and blades" model that I first remember learning about in college days, when a friend worked in a camera shop and was trained to never let a customer leave the store without a case and other accessories, after buying a camera body. Interesting that I remember the market leader of the day was the Canon AE-1.